Available as single copies or with a yearlong subscription, the Digital Edition comes in two forms: Enhanced and PDF. The Enhanced Edition has all the news, analysis, product reviews, and how-to’s, along with interactive features, videos, and slideshows—customized for consumption on your iPad. The PDF Edition is designed for your mobile device’s touchscreen to allow pinch and zoom. This month, we review the new iPhone 6 and 6 Plus. • Get to know iOS 8: Take a tour through the changes Apple’s new mobile operating system makes to the Settings, Safari, and Notifications apps. 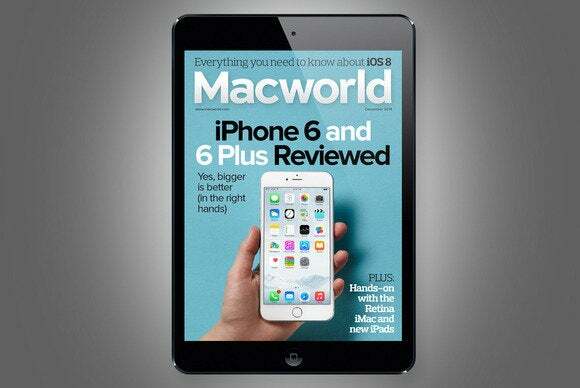 • Hands-on with the new iPads: We get our hands on the iPad Air 2 and iPad mini 3, and give our impressions. • Apple’s new 27-inch iMac with 5K Retina display: Apple rolls out its biggest Retina display ever and the results are stunning. • Adobe Creative Cloud Suite: New and updated tools aim to bridge desktop and mobile. • Macworld Editor Susie Ochs compares the spacious new iPhone 6 with its predecessor, the iPhone 5s. • Senior Editor Christopher Breen shows how to use iOS 8’s new Handoff technology to move seamlessly between your iOS devices. • Ride shotgun on a test drive of Apple’s new CarPlay interface, which lets you unleash the power of your iPhone via your car’s infotainment center. Our PDF Edition can be accessed with your subscription on Zinio. Macworld PDF Edition can also found through a variety of other digital newsstands such as Next Issue, Google Play, Kindle, and Nook.